As has been our long-standing tradition for a whole month now, this article presents the monthly update to our long-term view for the SPX, and our expectations going forward. However, before we get into the nuts and bolts of the Elliott Wave count, we're going to once again don our brightly-feathered edumacationalistic capz to help our readers understand a bit more about Elliott Wave Theory. On the surface, Elliott Wave is a unique way to understand why the market does what it does, and a detailed tool that allows us to project future price moves by extrapolating the fractals and patterns on the charts. The theory runs far deeper than that, though. At its core, Elliott Wave helps us to understand something much more meaningful than markets: it helps us to understand human nature. As such, it seems to apply to patterns found not only in markets, but in the rise and fall of nations, and even entire civilizations (as well as the ebb and flow of many other things in the natural world). The market's price movements are, after all, a reflection of human nature. By rule of intrinsic design, human nature must be universally reflected in all human constructs, be they markets, governments, or otherwise. Once you unveil one aspect of human nature, you are often able to locate the same common thread running throughout all human activities. This is one of the fascinating things about Elliott Wave, and part of what makes it such an amazing and complex theory. I have studied and applied it for many years, and continue to be in awe of its uncanny ability to anticipate the future. R.N. Elliott originally discovered the theory through his detailed study of decades of price charts. What he found was that the market advances its position forward (note "forward," not "up" -- advancement is relative to what the market is trying to accomplish, either up or down) in five-wave moves: wave one forward, wave two back, wave three forward, wave four back, wave five forward. It then corrects that advance in three-wave moves in the opposite direction: A forward, B back, C forward. The moves that advance the market's larger trend are called "motive" waves, and the moves against the larger trend are "corrective" waves. What is most interesting is that these fractals apply across all time frames: so each advancing wave within a motive wave (waves one, three, and five) is composed of an even smaller five-wave sequence. And each correction in a motive wave (waves two and four) is formed by an even smaller three wave correction. Further, each advancing wave inside the corrective wave (waves A and C) is formed by a five wave motive wave; but wave B is of course formed by - you guessed it - a smaller three-wave correction... and so on, ad infinitum. As a result of the fractal nature of the market, R.N. Elliott was also able to determine certain rules which govern price movements. For example, wave 4 never crosses into the territory of wave 1 (except during special patterns, which I won't be getting into here since this isn't intended to be a book). There are other rules which govern the length of waves, and so on. Having concrete rules which govern price movement means that the market in essense "locks" itself into certain future behavior; once part of the fractal is formed, it must be completed. This often affords a high degree of predictive value. To glimpse the predictive value here, let's use the current SPX chart as an example. The market made its all-time-high in 2007. To understand where that fits in, we first had to chart various markets backwards a couple centuries... but in the interest of brevity, we're skipping the backstory. Anyway, in 2007, it was our view that the market had completed a very large five wave sequence, called a Supercycle. A Supercycle is a five-wave sequence spanning decades, so that meant the market was also due for a very large correction. Indeed, this is what happened; you can see the market collapsed in five distinct waves from 2007 to 2009. This formed the A wave of (what we believe is) Supercycle Wave IV. From there, the market trended up until May '11. This bull move formed a clear 3-wave pattern, labeled on the chart as blue (a) and (b) to complete the larger red B wave. We should mention for the benefit of initiates that wave (c) of that move is not labeled; if it were to be labeled, (c) would be placed where the red B label is. The placement of the B label already indicates where (c) completed, which makes it redundant to label (c). Based on the very long-term charts, we expected and anticipated this Wave B rally even back in September '08 as the crash was underway and "the world was ending," while Wave A was still unfolding. This anticipatory power is another benefit of Elliott Wave Theory. In our view, May '11 marks the top to complete Wave B of Supercycle Wave IV, which means we are anticipating that Wave C down is in the beginning stages now. 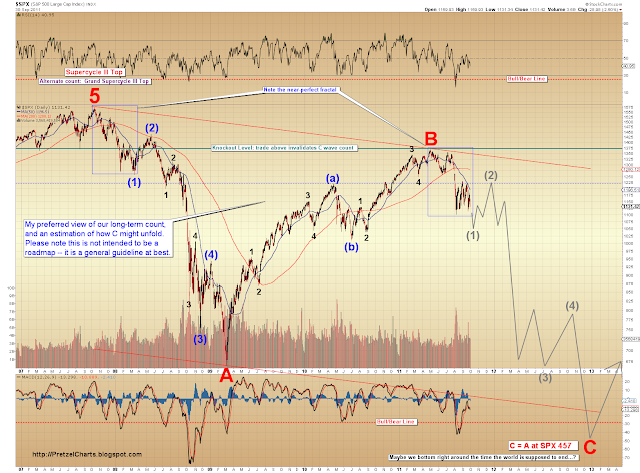 We can see on the chart that the market has now formed three clear waves in the downward direction off the May '11 high. It is of academic importance to note that until we break the 1101 low, we have not yet formed a complete five-wave pattern... but based on the larger pattern, it is our expection that this will happen in short order. So with Elliott Wave, no market move exists in a vacuum. Head and shoulders, wedges, triangles -- all of these patterns are but a small portion of larger patterns spanning the entire history of the market. The predictive value exists because once certain price movements are formed, this then requires other movements to follow and complete the fractal. When you understand the pattern going back hundreds of years, you are able to understand and anticipate exactly what is likely to happen next. It is beyond the scope of this article to discuss the entirety of Elliott Wave Theory, but I wanted to give our readers a very brief overview (brief being a relative term here) of how it works and why it allows us to anticipate future price moves (sometimes with an alarming degree of accuracy). Looking at the SPX chart, there are some additional things worth mentioning. We are viewing the current wave down as Wave Minor (1). Wave Minor (2) will then be a multi-month rally that retraces part of Minor (1); speaking generically, a 2nd wave retracement would typically be in the neighborhood of 40-60%. The exact retracement will be something we can determine with more accuracy as the 2nd wave starts to unfold. Beyond the expected price behavior, an additional asset to one's trading arsenal is an understanding of the typical psychology of each wave. 2nd wave rallies in bear markets are usually times of great hope -- so as we rally in Minor (2), good news will be the order of the day, and the predominate view will be that the big selloff in July and August was a fluke. Occasionally, fundamentals actually improve during 2nd waves; so perhaps there will be some aggressive action from the Fed, or the Eurozone will find some temporary fixes to their problems. But if our analysis of the wave structure is correct, in the end it will be the good news that ultimately proves to be a fluke. The wave which follows the rally will be the 3rd wave down. Third waves are the "moment of recognition" for the masses. Right about the middle of the 3rd wave will be when the majority realize that things are going very badly (think September '08). As a result, 3rd waves in bear markets almost always move extremely fast with lots of panic selling. From an Elliott perspective, we are likely to experience a crash even more frightening than September '08, because now we are in Wave C, which is itself a 3rd wave (at least, if my understanding of the alphabet is correct). One can see that many of the "hopes" present in Wave A have since been proven ineffective (lower interest rates, bloated government stimulus packages, quantitative easing, etc. ), so the psychology of investors is much more fragile now than it was in Wave A, and it will take less of a crisis for investors to flee today than it did in 2008. Accordingly, the minor third wave within this larger third wave will probably be a terrifying free fall. So, what's the good news? Well, the good news is: if our preferred count is correct, after Wave C bottoms a strong new bull market will arise from the ashes. When all hope looks lost and there's blood in the streets, Supercycle Wave V will arise and lead us out of the darkness. Unless, of course, the purple annotation which says "Alternate count: Grand Supercycle III Top" is correct, in which case we probably have another lost decade still ahead of us. But that's a whole 'nother article! Besides, we wanted to end this article on a high note, so be aware that we are assigning less than a 50% probability to the view that we completed Grand Supercycle III in 2007. Much less. Maybe 49.9778% max. So it's all good! Thanks, Pretz, for your fascinating analysis. Might you be willing to consider going to white background and black print for your posts? The charts come out great, but the white shiny writing in your posts is hard on my eyes. I think that Big Ben will find some way to artificially stop this decline long before its natural endpoint at 457. We'll see. This is great top notch analysis you are doing here. I see you have an article at Minyanville too. You're getting famous! Well-deserved! Personally, I think Ben will be powerless against the decline: the charts usually predict the news (in my experience), so this chart is screaming "black swan event" to me. Something will unravel that can't be stopped by all the rice Uncle Ben can throw, just like in 2008. Just MHO. And, yes,I will consider changing the color scheme as well. This reminds me a bit of 2008, with the bailout package. If I recall my timeframes/news correctly (which I may not, I've always been more into charts than news)... the bailout package idea initially generated a rally... then the vote failed and the market plunged... then the vote passed and the market snapped back... then it collapsed almost immediately. Anybody have any insight as to whether my recollection of time frames is accurate? Euro just broke 135. Futures heading down. I notice that you have the 666 low as large red A down. In EW terms, what would you label the 2003 low as?